Somehow after all these years of visiting and living in the D.C. area the National Gallery of Art is one place Mik has never been except their sculpture garden, which reminds me I still haven't taken him over to the Hirshhorn one. The East Building in particular has been on our list to visit ever since it reopened in November. One of my favorite parts of the museum is the Terrace, where they have a few sculptures on display and you can get a good view of Pennsylvania Avenue. Mik liked the giant rooster, but he thinks it should be repainted red. He also really enjoyed the Alexander Calder pieces on display in one of the exhibits on the Terrace level. Mik also had fun taking this picture of our cousin, Kirsten. He thought this art looked like a tongue and he knew if he asked her to stick her tongue out for a photo she would without question. We did not have much time to explore the whole museum because Kirsten had to get on the road home, so we kind of bounced around to a few of the different towers and levels to get a general feel of what was on display currently. 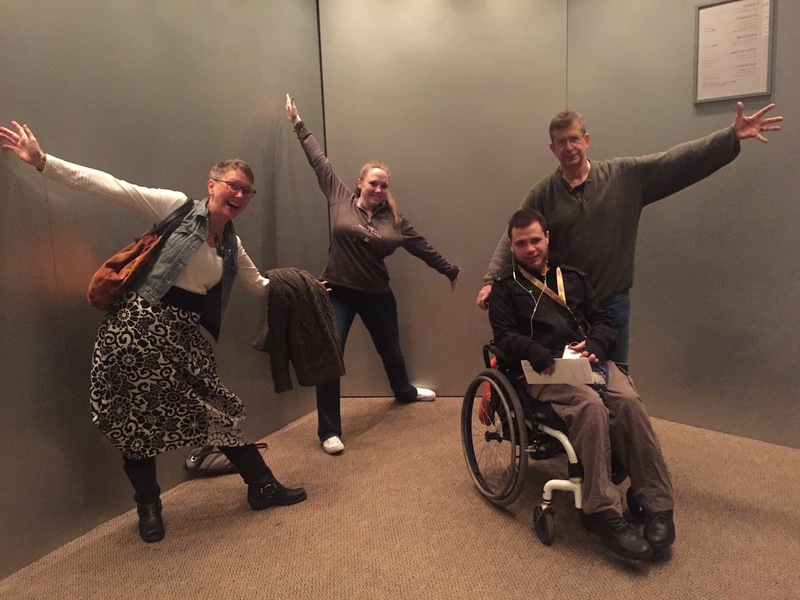 This did still allow us to experience what I think is the most interesting thing to do at this museum - the elevators. The elevators vary greatly in size depending on where you are in the museum, although thankfully there are none that are like the tiny one at the National Portrait Gallery. The most fun in the giant elevator in Tower 3, especially if you can get it to yourself, which we did the first and last time we used it. The second time we were on it there were other people and Kirsten said that if there weren't any people in the elevator she could probably do a cartwheel in it. Thus, when we got on it to go back to the ground level to leave and we had it to ourselves I told her now she could do a cartwheel. If you want to experience the terrace you have to go to that level from Tower 1 or 2. These towers both have elevators have a sort of hexagon shape and are quite small, but were still adequate for a wheelchair and probably five people. Tower 2 also has a second elevator near the stairs that is a good size for those that want to access the terrace and not experience the small elevators that can be kind of claustrophobic. Mik's favorite piece of art was this one that reminds him of the art he has hanging in his room. Overall it was a fun visit to the museum and Mik wants to go back to see the parts we missed this time.